east with a view of the wide sweep of shore and some nice tidal flats, and through a residential area where houses hid inside hill-like silhouettes of wind-sculpted trees - "would you like to live in a krumholz?" Sone of the winding coastal roads were lined with Japanese Knotweed on both the lip of the seaward slope and on the land side - other were similarly dominated by roses. 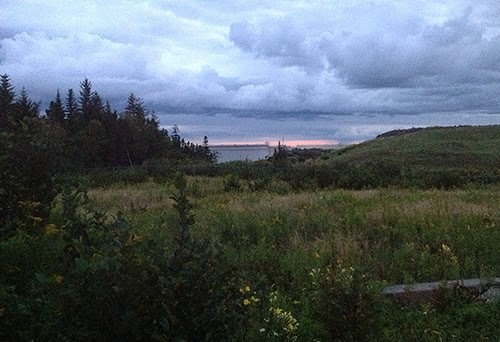 Here we are at dusk, 1.2km from the proposed terminal of the pipeline, and the closest public approach to the site. This is already an oil processing facility. The tops of three gigantic white tanks reflect the colours of the evening sky just beyond what seems to be a low bluff. A grassy/herbaceous meadow slopes gently seaward with Alders beyond. A chainlink fence describes a perimeter across the photo, about 100 metres in from the road. The meadow is full of diverse plants we don't recognize in the dusk - Fred takes a specimen of an Evening Primrose. Behind us is a coniferous wall of Spruces. As we head north west for further field work along the proposed pipeline route, this is the first of daily postings about our progress or lack of it. (We almost immediately demonstrated a lack of progress by backing into a ditch while trying to get a better angle for a photograph, and were cheerfully rescued by a friendly fellow from St. Martins, with whom we shared a lively discussion about social and ecological problems of industrial development in New Brunswick). Very pretty, gigantic white tanks notwithstanding. Yay for Tim's. If only they'd give up that palm oil.